A Navy laboratory is investigating whether smaller U.S. Navy ships could host hospital facilities to support surgeries at sea. Naval Surface Warfare Center Panama City Division is looking into the possibility of conducting surgeries aboard the Littoral Combat Ship, Expeditionary Fast Transport (EPT) (formerly known as the Joint High Speed Vessel) and other “alternative platforms.” A Human Systems Integration Team, headed by NSWC PCD Biodynamics Laboratory engineer Eric Pierce, is hosting a proof-of-concept study from Aug. 31 to Oct. 9, 2015, to “deliver qualitative analysis to determine the feasibility of conducting select surgical procedures during high sea states,” according to a Navy statement. “Once we have the study’s findings, we’ll take that information and give to leadership for further exploration to determine the feasibility on smaller navy vessels, using modeling and simulation of the high speed vessels and littoral combat ships,” chief of naval operations staff medical analyst Lt. Cmdr. Randy Dee said in the statement. The select surgical procedures included in the study are stabilizing a fractured pelvis, treating a displaced femur fracture, treating an open wound of the abdominal wall, and a traumatic amputation of the leg. A medical team – consisting of a surgeon, a nurse, a surgical technician and an anesthesiologist – would conduct simulated surgeries in a realistic environment in up to sea state five conditions. 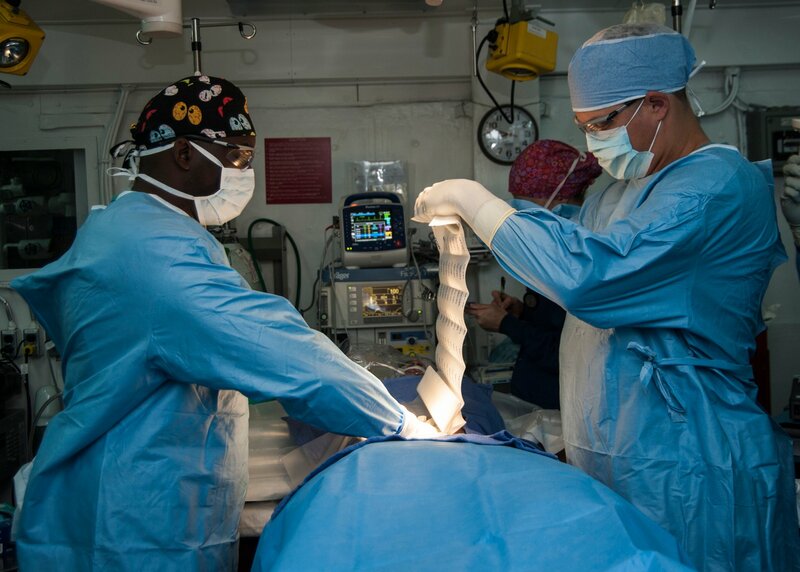 In addition to the Navy’s two hospital ships – USNS Mercy (T-AH-19) and USNS Comfort (T-AH-20), which each have 12 operating rooms and up to 1,000 beds – larger ship classes have advanced medical capabilities. The Nimitz-class aircraft carriers have about 50 beds in the inpatient ward and three beds in the intensive care unit, as well as an operating room, dental surgical spaces and other supporting facilities. The Wasp-class amphibious assault ship has a much larger surgical capability – six operating rooms and 64 hospital beds – though the new America-class big decks will have just two operating rooms and 24 beds, according to a Marine Corps amphibious capabilities document. Both the LCS and the high speed vessels are known for having vast amounts of open space that could host a range of specialized packages, including medical facilities, but the smaller size of the ship may make them more susceptible to turbulence in high sea states. The study will determine what combinations of surgeries and sea states are feasible and safe for patients.